Sorry I’m late with this week’s link up. Its been a rough week around my house. Three doctor appointments for Nadia last week and just getting home from the ER tonight. The doctors still have no idea what is making her sick….. Now, she needs to see a geneticist ( this will be her 5th ‘ist’ doctor) but do you think I could get ANYONE to answer the phone for any of the five numbers I tried? NO! Has anyone returned my calls? NO! I’m so irritated I could spit nails! Ok, calm down, find Joy in today. Well, I’m joyful that they confirmed her chest pains are not blood clot or heart related. Thank you God! 1. Add a link that captures how you Find Joy in the Everyday. It can be a craft, book review, personal story, etc. Just make sure it captures joy. Do not link up other link parties or product reviews. 2. Tweet or share on Facebook your link with #JoyHopeLive (this makes it simpler for me to give you a retweet and comment). Each week we add the posts to a pinterest board. Go love and share some pins. 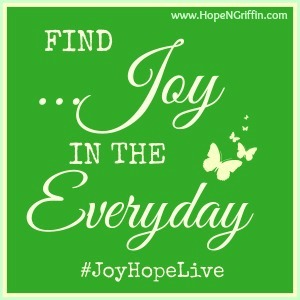 I just shared my post on the #JoyHopeLive linkup and so can you! Click To Tweet 3. Comment on the posts you love and the two directly before yours. Be sure to include #JoyHopeLive when you do so they know where you found them. 4. Grab the button! Share it on your sidebar or in your post so others will join us next week. Glad you made it Pili!